How far the Koreans have come. 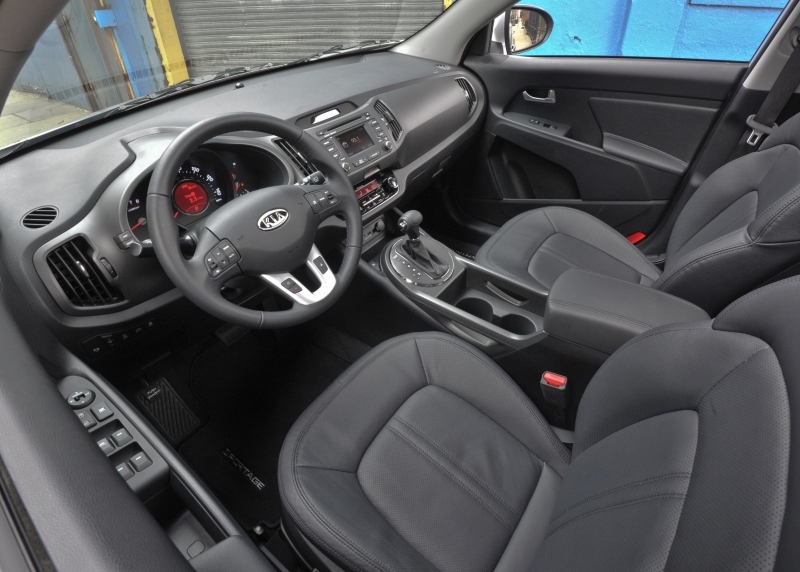 In 2009, Hyundai/Kia became the world’s fourth largest automobile manufacturer, but if you trace the Kia brand back to its roots in North America, you’ll find the Sephia and the Sportage. Back then, the Sportage was a simple body-on-frame compact SUV with a single-cam 2.0-liter engine and had few comforts on offer. Today, it’s quite a different market, and the Sportage brings with it modern flair such as LED running lights, a cooled driver’s seat, Bluetooth connectivity, a sonar parking sensor system and a whole lot more, not to mention the much improved interior quality and ergonomics. The powertrain is all new, featuring a 2.4-liter inline four-cylinder engine that conveniently makes more power than the outgoing 2.7-liter V-6 whilst simultaneously returning up to 31 mpg in city driving. If that sounds too weedy to you, however, there’s a more powerful turbo version in the works that should provide around 270 horsepower without too much of a hit in the fuel economy department. It would seem the small SUV hierarchy may be due for a regime change. The Sportage mixes a modest entry-level price with high fuel economy, two things consumers in this space hold in high regard. 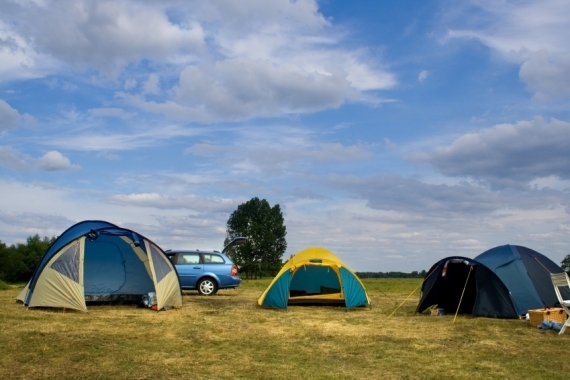 Luggage space has increased along with vehicle size and technological integration. Front-end LED lights add some attitude to the entry-level compact SUV segment. A stiff suspension setup may not be for everyone, and the same goes for the heavy steering, two characteristics not typically found in this segment. Power may be too little for some consumers, who will have to wait a while for the turbo. Given the overall softness of most cars in this segment, we were surprised to find that the Sportage has a robustly stiff ride. Stiff to the point that it almost feels like a dedicated off-roader, in fact. If it’s a tough-feeling small SUV you are looking for, look no further, though we suspect this stiffness may turn off some customers as well, as out on the open road the suspension can have trouble keeping up with overly bumpy sections of road. On the bright side, though, the steering has enough weight and feel to it, and even at parking lot speeds you’ll always know where the front wheels are pointed, which certainly isn’t the case with every car on the market. Those fearing the four-cylinder might not provide enough power will be happy to know it has good midrange strength, but you’ll have to keep your foot in it to produce meaningful acceleration. A 2,000-lb towing capacity will prove useful for those looking to haul light loads, but don’t plan on towing any speedboats. 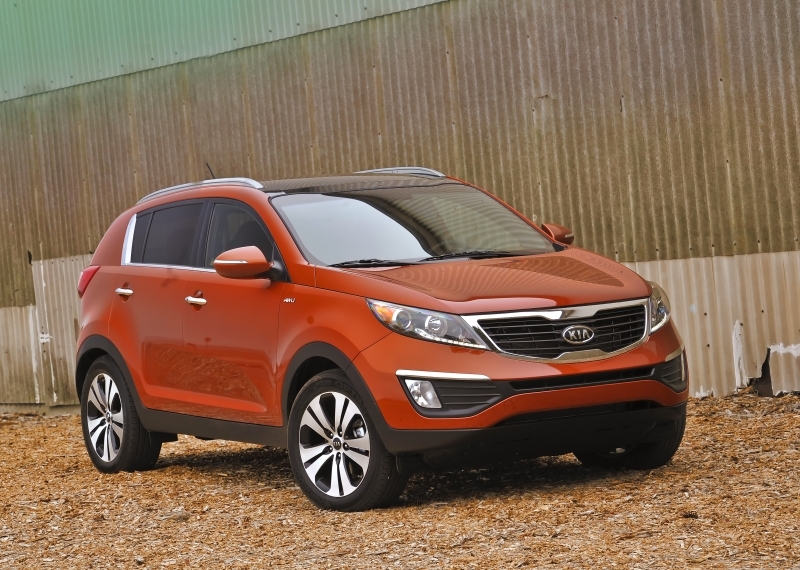 The Sportage is powered by a 2.4-liter inline four-cylinder engine that makes 176 horsepower and 168 lb-ft of torque. Both six-speed manual and automatic transmissions are available. Power is driven to the front wheels in standard guise or all four via a lockable all-wheel drive system that is available as an option. If you live in a warm climate, an available cooled driver seat – a segment first – is a welcome option, and A/C air is also routed through the glove box to keep whatever you put in there from melting. 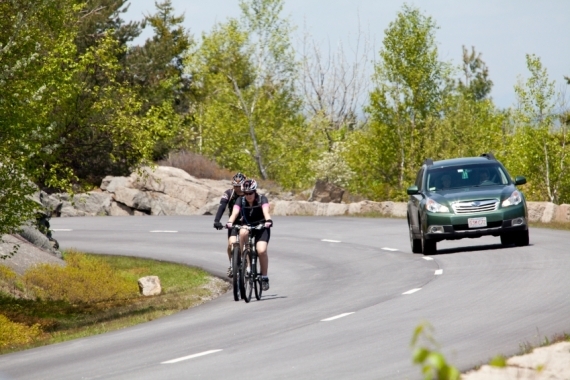 Downhill brake control will help drivers safely navigate descents of more than eight percent, and hill start assist makes moving off the line on an incline a whole lot easier. Controls for the audio system, Bluetooth and cruise control are all located on the steering wheel as standard, and you won’t have to shell out any extra cash for the Bluetooth functionality. An AM/FM/MP3 Sirius satellite radio enabled stereo system comes standard, and navigation is optional. Kia’s UVO voice command system is also available, a technology solution developed in conjunction with Microsoft which makes browsing media while driving a hands-free breeze. Fuel mileage numbers are a big talking point in this segment, and ditching that V-6 engine has helped boost the Sportage’s numbers. 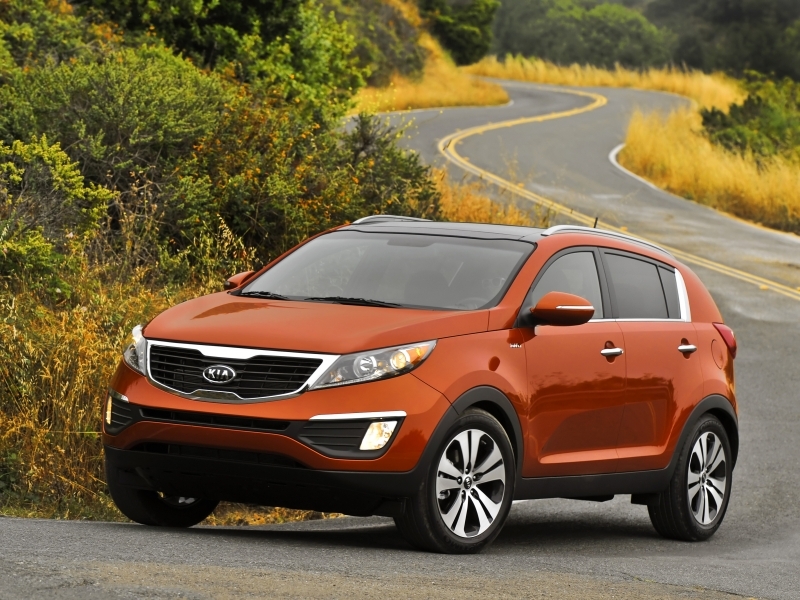 At 22 mpg city, 31 mpg highway, the Sportage won’t disappoint. Ingress and egress have been improved along with legroom thanks to a new seating position. The driver sits behind a chunky dashboard, and on the whole, the ergonomics of the interior have improved greatly. The high beltline contributes to a relatively small rear window, which doesn’t completely destroy rearward visibility but definitely hinders it. 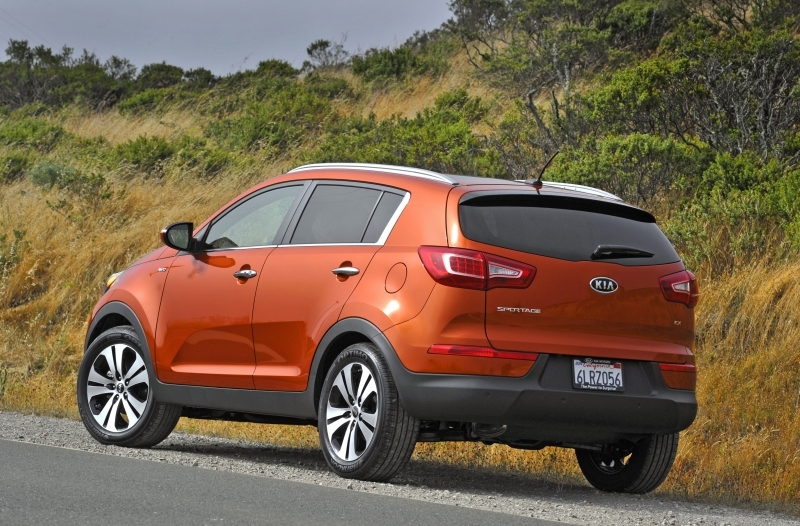 With its high beltline, angular grille and LED-lit front-end, the Kia Sportage brings a welcome amount of aggression to a segment that typically values understated lines and conservative design. That said, it does have some Mazda CX-7 to it, but that’s not a bad thing. 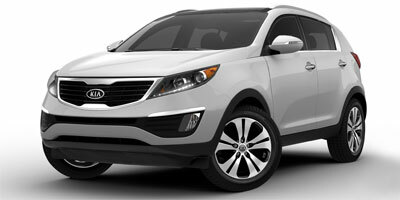 Starting MSRP for the Sportage is $18,295, and even with handling and destination it comes out under the $19K mark. A fully loaded EX model with all boxes ticked won’t top $28K. Key competitors include sister company Hyundai’s Tucson ($18,995), the Suzuki Grand Vitara ($18,999), Subaru Forester ($20,295), Nissan Rogue ($20,460), Mitsubishi Outlander Sport (pricing TBD), Honda CR-V ($21,545) and Toyota RAV4 ($21,675). While its exterior refresh is undoubtedly the boldest asset in the new Sportage’s portfolio, what’s under the skin certainly goes a long way as well. Considering there is a high-output turbo model in the works to satisfy the power-hungry, we think the new Sportage has its bases covered, especially when you consider the MSRP.